Place 3 camel cards face up between the players. Shuffle the remaining cards well. Deal 5 cards to each player. The remaining cards are left face down as a draw pile (deck). Take the first two cards from the deck and place them face up next to the camels. (There may well be 1 or 2 camels drawn). The market is now ready. The players then remove any camels from their hands and put them face up in a in a stack in front of them. This forms each player's herd. Sort the tokens by goods type. Make a pile for each goods type in descending order of value. Spread out each pile so that both players can see all the tokens' values. Sort the bonus tokens by type. Shuffle each type separately, then form 3 piles, which are not spread out. Put the camel token next to the bonus tokens. Set up the tokens as shown in the above illustration. Put the 3 Seals of Excellence where the players can get at them. Pick a starting player. You are now ready to start playing. Your turn is now over and your opponent chooses one of these actions. ... exchange the same number of cards. The returned cards can be camels, goods, or a combination of the two. C. take all the camels. Players may never have more than 7 cards in their hand at the end of their turn. To sell cards, choose one type of good and discard as many cards of that type as you like onto the discard pile. Each sale earns goods tokens and, if the sale is big enough, a bonus. A sale is carried out in 3 steps. Sell as many cards as you want, placing them face up on the discard pile. Take as many tokens as cards discarded (starting with the "top" of the corresponding row, that is, starting with the highest values). Stack the tokens in front of you. If you sell 3 or more cards, take the corresponding bonus token. NB: the value of a bonus is not known until it is drawn. For 3 cards sold, it will be 1, 2 or 3 rupees. For 4 cards sold, it will be 4, 5 or 6 rupees and for 5 cards sold, it will be 8, 9 or 10 rupees. Unlike the goods tokens, the rupee value of the bonus token is only printed on the back (hence the question marks on the front). When selling the 3 most expensive goods (diamonds, gold and silver), the sale must include a minimum of 2 cards. (This rule applies even if there is only one goods token of a given type left). You can only sell one goods type each round, never more. or there are no cards left in the draw pile when trying to fill the market. If neither player has 2 Seals of Excellence yet, set up the game again from the beginning and play a new round. The player who lost the previous round starts. 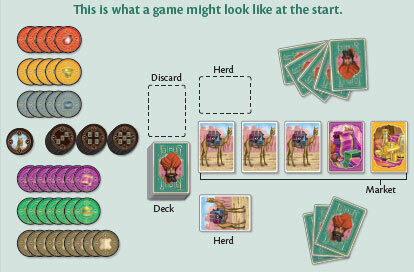 The player with the most camels in his herd receives the camel token, worth 5 rupees. The players turn over their tokens and add them up to determine who is the richer. The richer trader takes a Seal of Excellence. In the case of a tie, the player with the most bonus tokens takes the seal. If the players are still tied, the one with the most goods tokens takes the seal. The game ends immediately as soon as one of the players has 2 Seals of Excellence. 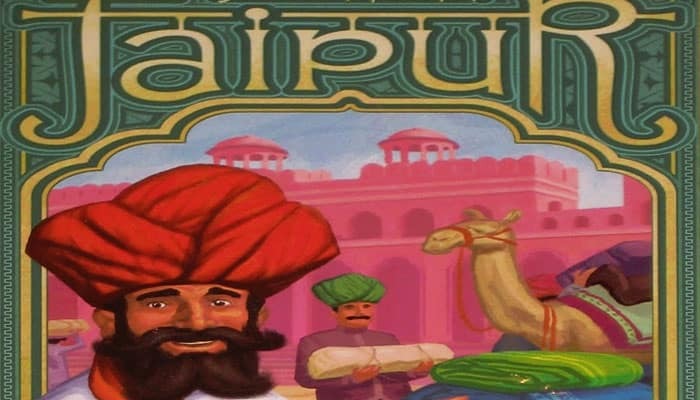 That player wins the game and is appointed as the Maharaja's personal trader.